*please make your reservation by all means until the day before the arrival date if you want to leave your luggage here from 11:00 to 16:00 because the entrance door is closed this period. Also, you have to pay an additional 200 yen when you want to leave your luggage before 16:00. ●There's no cancellation fee up to 8 days before arrival. 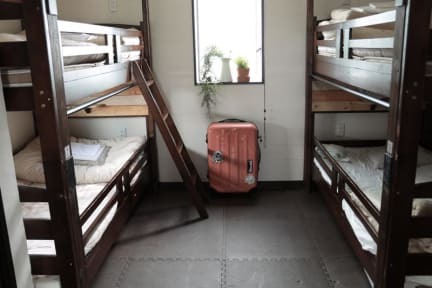 ●The dormitory room may have the movement of the room by a day when there are the reservations of all dormitory room. A newly-built guest house opened on August 1, 2011. 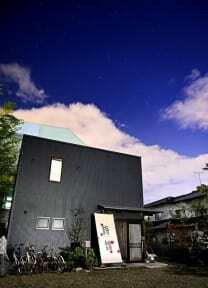 The first guesthouse with a bar space in Sendai. Conveniently located 15 minutes from the JR Sendai station by taxi, and 5 minutes from the Nigatake Station on the Senseki Line by foot. JR Tohoku Main Line, Higashi Sendai Station Get on the Tohoku Main line, and get off at the Higashi Sendai station　(1 station, about 5 minutes). This is a wonderful hostel. The people are very friendly and the place is nice and clean. They offer a set meal dinner every night for ￥700 that focuses on fresh and local foods and is always delicious. They also have beer and liquor for sale, but let you bring in your own if you prefer. I definitely recommend this hostel to anyone staying in Sendai. I had so much fun staying at Umebachi! Every night pretty much all the guests and the staff gathered in the common area and just hanged out. The dinner they offer is also very delicious! Thank you! Staff are just lovely! They serve dinner for 700 yen with all the guests and friends of the staff which allows for great cultural exchanges. Be warned that most guests staying here are japanese (as is the staff) so it can be a bit difficult if you don't know some basic japanese phrases. The staff are really friendly and make the effort to talk to you in English. They make dinner every night which you can have for the good price of 700 yen, and if you do not want what they are making do not let that stop you from joining them with the chatter and laughter of the place. We loved our time there and real want to go back. It can be tricky to find if you use GPS google maps as it will take you in circles away from the location. It was pretty laid back I was only here a single night to crash but staff was really nice. Not far from the Rakuten Baseball Stadium if you're looking to watch a game. Very friendly staff, free breakfast and available dinner were very good. Slightly difficult to find, but got there eventually! Unfortunately, some of the other guests were a tad noisy, which slightly spoiled my stay. Be warned, most of the guests are Japanese, so if you don't speak the language you may have a hard time. Uncomfortable bedding situation, also overpriced for what you get. Breakfast is a couple pieces of bread, and after not sleeping all night because of guests waking up early and the hard beds, I was refused to be given breakfast after being 45 mins late to it. You can stay for free in Sendai with Kodo, much better stay, find him on Couchsurfer!